This was a little Friday night jaunt close to home with the twin objectives of proving the download of details to the Garmin and entertaining the kids for a while before bedtime. Close to home, but nevertheless motorised. Some days only the car will do. So into the Batmobile for the rather short journey round to a local landmark know to us as Jimmy’s Knob. Don’t ask why, it just is. Jimmy’s Knob is home to Monkston Madgirl’s cache called 360. The girls loved this one because Jimmy’s Knob has a spiral path leading from car park to top. In Milton Keynes terms, the view from the top is good. You can see all the way round. Howe Park Wood on one side, city centre on the other. Shenley Brook school over there to the right of Morrisons and Bletchley over there behind the rapidly expanding new “Home of Rugby” The cache proved quite easy and is definitely worth hunting out just because the cache itself is a cunning little container. Next up was the Secret Bunker – EV by mafiu. This was only a couple of hundred yards away but far enough to go in the Arkansas Chug-a-bug. Parked up on the roadside in a housing estate which was really only just big enough to park in. Hope this is a quickie otherwise it’s likely the locals will call the Rozzers to get our car towed for causing an obstruction. 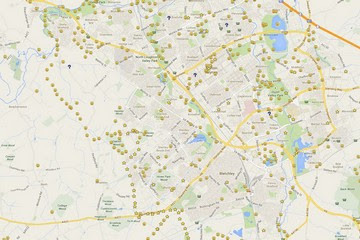 The cache is marked sort of round the corner in an area that might be described as “non-preferred”, even by an estate agent. Thankfully though, it was a bit quiet. The GPS was indicating an unlikely looking bunch of vegetation and after much general farting about there with the kids getting bored we switched to “if I was planting this, where would I plant it” mode. This strategy yielded success in less than a minute. Let’s face it, even in a quiet location you wouldn’t hide it in vegetation that loses its leaves in the winter, so which plants around here don’t ? Swapped some bits and bobs. Signed up and jumped back into Chitty-Chitty-Bang-Bang for the short trip home. It turned out to be a weekend of short dashes to do a couple here and there. But no more tonight because the kids were bored, it was getting late, and the midges were coming out for the night. Run away !